Note: Perico ha esordito in Serie B in Perugia-Monza 2-1, stagione 1982/83. Perico ha allenato il Cernusco (1998/99, Promozione) e il Cologno (1999/00, Promozione). 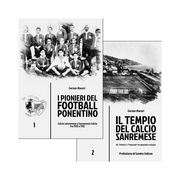 This entry was posted on lunedì, 22 settembre 2008 at 09:41 and is filed under Giocatori. You can follow any responses to this entry through the RSS 2.0 feed. You can leave a response, or trackback from your own site.